This Biosecurity Plan for Palmyra Atoll was developed for The Nature Conservancy (TNC) Palmyra Program to refine and expand goals and objectives developed through the Conservation Action Plan process. The Biosecurity Plan is one in a series of adaptive management plans designed to achieve TNC’s mission toward the protection and enhancement of native wildlife and habitat. The Biosecurity Plan focuses on ecosystem security, and specifically identifies and addresses issues related to non-native and potentially invasive species. The Plan attempts to identify pathways of invasion and strategies for preventing or reducing new introductions. Overall, the Biosecurity Plan provides a framework to implement and track the progress of conservation and restoration goals related to non-native species on Palmyra Atoll. Palmyra Atoll is one of the Northern Line Islands in the Pacific Ocean southwest of the Hawai`ian Islands. It consists of many heavily vegetated islets arranged in a horseshoe pattern around four lagoons and surrounded by a coral reef. At present, Palmyra Atoll harbors various non-native or invasive species in the terrestrial and marine ecosystems. The most notable examples of terrestrial invasive species include coconut trees (Cocos nucifera) and black rats (Rattus rattus). Although it is unclear whether they are non-native, coconut trees are currently the most dominant plant across Palmyra Atoll. They compete with native plant species for space and resources, and are potentially detrimental to seabirds dependent on native vegetation. Black rats are known to predate ground-nesting seabirds and are likely responsible for the lack of burrowing seabird reproduction on Palmyra Atoll. The most notable example of a marine invasive species is the corallimorph (Rhodactis howsei). Although Rhodactis howsei is a native species, it can take advantage of human-altered habitat and significantly change the natural habitat by aggressively outcompeting native corals. Although the extent and impacts of these and other non-native and (or) invasive species are not fully understood, they are clearly a threat to the native species and overall ecosystem integrity of Palmyra Atoll. In fact, non-native invasive species have been considered the most important threat to ecosystems in Hawai`i and the second most important threat to biodiversity world-wide. Palmyra Atoll is somewhat protected because of its remote location, but there are still potential pathways for the introduction of non-native and possibly invasive species. With the continued influx of aircraft and ocean vessels and their contents to and around Palmyra Atoll, we anticipate many more concerns related to the import and spread of non-native invasive species in the future. In terms of ecosystem security, prevention is the most effective and efficient tool for managing invasive species. There are various potential pathways for introduction and spread of non-native species within Palmyra Atoll’s terrestrial and marine ecosystems. Identification of these pathways provides a first step in preventing introductions. We also recommend establishing, enhancing, and enforcing quarantine protocols to prevent future non-native species invasions. Other critical steps to minimize the impacts and spread of invasive species include early detection through inventory and monitoring, as well as containment, control, and management of non-native species already established at Palmyra Atoll. These efforts in combination with research and education will serve to inform management decisions related to ecosystem integrity. Along with reinstating ecosystem security, this Biosecurity Plan aims to evaluate new risk factors related to non-native and potentially invasive species. To that end, an adaptive management process of audit and review is highly recommended to ensure the implementation and efficacy of the management practices outlined above. In addition, it will be important to identify high risk, non-native species and potential invasion routes. An awareness of potential problem species will provide an important step in prevention. Lastly, the development of offsite controls could greatly reduce the potential of non-native species introduction. Non-native species possibly may be reduced at their sources through partnerships with relevant agencies and collaborative efforts. We advise ongoing assessment of this Biosecurity Plan, as it contains strategies that require widespread cooperation and coordination in order to be effective. The Biosecurity Plan is a working document and subject to periodic review, refinement, and improvement as new information becomes available. The strategies associated with incipient and established non-native species will continue to be developed and should be implemented in an adaptive management framework. Constant review and evaluation of these biosecurity procedures will provide important management information to improve protocols and methods. Refining conservation goals via feedback loops will improve the ability of The Nature Conservancy and their partners to make effective decisions in evaluating and conserving ecosystem integrity. 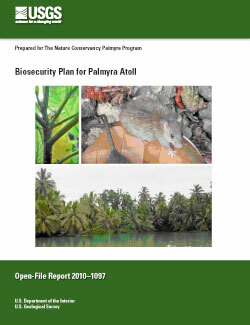 Hathaway, S.A., and Fisher, R.N., 2010, Biosecurity plan for Palmyra Atoll: U.S. Geological Survey Open-File Report 2010-1097, 80 p.